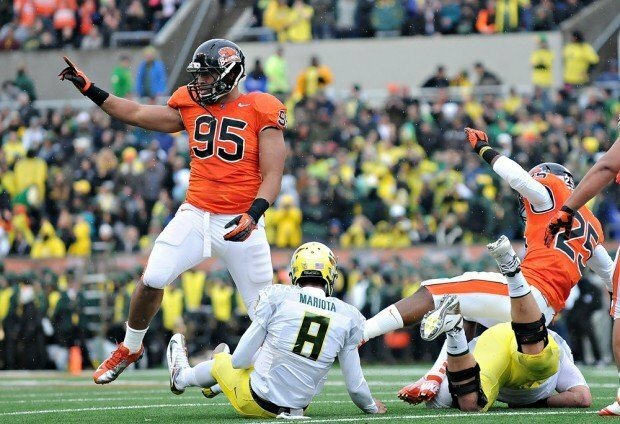 The Vikings bolstered their pass rush by adding Oregon State defensive end Scott Crichton in the third round. The Vikings spent their first third round selection (72) on Oregon State defensive end Scott Crichton. He corralled 22.5 sacks in 38 games at Oregon State and is a pure pass rusher. Crichton has versatility to shift up and down the line of scrimmage, which fits the philosophy Mike Zimmer is looking to implement. He is very muscular and can shed blocks very well in one-on-one situations. He is very rough around the edges and many argued he should remain at Oregon State for his senior season. Instead, he entered the draft and was graded out by draft experts as a second round prospect. Mike Zimmer can rotate Crichton throughout his front-seven and keep the legs fresh among his defensive line. With some coaching in the technique area and some work in the classroom, Crichton can flourish in the Vikings defense. Being a situational pass rusher will be his role, which is the perfect scenario for the young player. The Vikings selected Scott Crichton with value in mind and will use him as a third-down pass rusher, which adds more threats to a developing Vikings front-seven. Minnesota holds an additional selection at pick 96 in the third round, which is their final selection during Friday night's festivities.